EIC Solutions offers a wide range of standard and custom cooling solutions designed to protect sensitive electronics and meet the demands of a broad range of industrial and commercial environments – including manufacturing, material handling and metalworking. When production schedules are on the line, EIC’s enclosure air conditioners are there to keep machinery running smoothly by protecting computers, industrial controls, machine tools, drives and other electrical/electronic equipment from damaging heat, dust, moisture, and corrosion. Industry’s desire for new and more complex automation and robotic systems has dramatically increased the demand for state of the art electronic control systems and processes. As heat fluxes continue to rise, this has presented significant challenges to keeping these systems running smoothly. Today’s automated manufacturing systems are running applications that require increasing computational power. These systems produce significantly higher levels of heat than previous systems and as a result are more sensitive to harsh environmental factors. 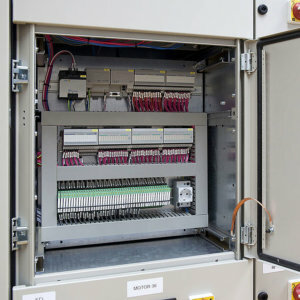 Typically these electrical/electronic systems are installed in sealed enclosures making thermal overrun temperatures one of the leading causes of failure and reduction in MTBF. The removal of heat generated by these advanced electronics systems has grown to be a critical issue since these systems must often perform in high ambient temperature environments. In addition, many of these systems utilize rack mounted electronics that were originally designed for operation in air conditioned buildings, not in harsh manufacturing environments. These rack mounted systems are now being installed both indoors and outdoors in enclosures that are exposed to ambient temperatures up to 120° F and in some cases much higher. In addition to extreme temperatures, these sensitive electronic systems are also subject to the dust, dirt, moisture, corrosion, and vibration typical of the harsh conditions found in manufacturing environments. In order to effectively solve these complex cooling problems, manufacturing designers and engineers are turning to EIC’s thermoelectric cooling systems as an ideal solution when a low to moderate amount of heat must be handled in a harsh environment. Using patented solid-state technology to accomplish temperature change, EIC’s thermoelectric coolers eliminate the need for refrigerants and operate with fewer moving parts. They can cool enclosures to temperatures below ambient conditions while producing little noise and vibration. Featuring reliability and a long life span coupled with flexible input power requirements and mounting arrangements, EIC’s thermoelectric air conditioners offer significant advantages over conventional cooling methods such as compressor-based systems. In addition, they are ideal solutions for applications where the cooling system must be portable or subjected to motion. To provide a complete solution, EIC offers packaged systems comprised of enclosures and cabinets with integrated cooling assemblies. These systems are designed to protect and cool electrical/electronic systems in a wide range of industrial applications including factory automation, process control, and test and measurement systems. These integrated cooling systems offer superior performance with excellent temperature uniformity, resulting in lower electronic component temperatures, increased operational life and reliability (MTBF). Additionally, the compact size and weight of EIC’s enclosure air conditioners allows them to fit a wide range electronic enclosures, electrical cabinets, rack mount equipment enclosures and workstations. Standard product modifications are also available to meet customers’ exact needs such as custom sizes, doors, holes, cutouts, colors and accessories to reduce assembly time, and for easy integration into new or existing systems. CLICK HERE for our Control Panel Applications Sheet. Need help sizing your application? Download sizing guide.